Scale Model Challenge is proud to be the host of a large variety of traders that caters to the needs of all visitors. 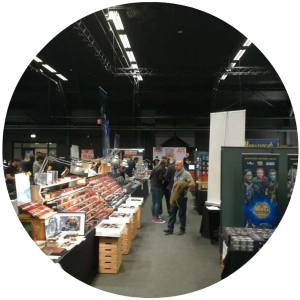 At SMC our aim is to show you everything our hobby has to offer, and that is why many different vendors from all over the world are present again at SMC 2019: traders, manufacturers, publishers etc. Whatever it is you are looking for, be assured to find it at SMC: Kits, figures, tools, paints, books, magazines, diorama accessories and everything else that you can imagine. SMC is the best one stop shopping event in the world! The full list of attending traders will be published at the bottom of this page late Spring 2019. Please note that all vendors are happy to take your pre-orders to SMC. Click on their names to be guided to their websites, or occassionally, to their Facebook page. We recommend that you also visit our SMC Facebook page, where we also highlight our vendors on a regular basis and for other information. Please note that all vendors are happy to bring your pre-orders to the show. Are you interested in having a trade stand at SMC 2019? Please note that the available space for vendors is fully occupied. We will leave the registration form available, but please note that you will be added to the waiting list and you will be informed in case space becomes available.